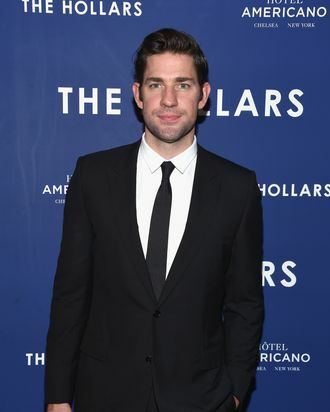 John Krasinski, probably wearing more clothes than you’d want. You likely remember that sweet Jim from The Office got super buff for his movie 13 Hours. The people liked it! Emily Blunt (supposedly) likes it! John Krasinski likes it! “I love feeling strong,” he said of the unveiling of his body. And you’ll be happy to know that he didn’t backslide into a giant doughnut hole. “I’ve kept working out all along,” Krasinski told Vulture at a Peggy Siegal Company screening of The Hollars on Thursday. “I’m not as big as I was in 13 Hours, but it’s really fun.” This will ease the transition for when he ramps up his routine again in order to be ready for his star turn in Amazon’s Jack Ryan series, where he’ll be playing the titular action hero. “I’ll start that crazy workout soon again, [and] try to eat fewer calories for a little while.” Beauty is pain, after all.